A thousand times, "No!" says pastor and author Alistair Begg. Instead, Begg says we are the objects of God's providential care. We reside under His guiding and protecting hand. God's authority is neither capricious nor vindictive-quite the contrary-God works through the circumstances of life to bring about something miraculous, something abundantly good, even out of what we perceive to be our darkest moments. We can entrust the baggage of our past, the fears of our present, and the prospects of our future to the God who cares. 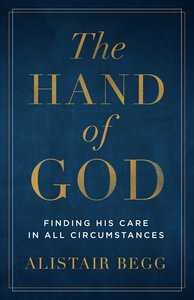 About "The Hand of God: Finding His Care in All Circumstances"
ALISTAIR BEGG (Trent University; London School of Theology; Westminster Seminary) was born in Scotland and spent the first 30 years of life in the United Kingdom. Since September of 1983, he has been the senior pastor at Parkside Church in suburban Cleveland, Ohio. He is the daily speaker on the national radio program "Truth For Life" which stems from his weekly Bible teaching at Parkside, and is the author of "Made For His Pleasure, Lasting Love, " and "What Angels Wish They Knew." He and his wife, Susan, have three grown children.